In the list of Customary Tenants of the Manor, 1554, we find `William Hix, 1 Hospice.' Later, in the Survey 'Men and Armour' in 1608, Issold Stich is recorded as `Inkeeper'(sic). The Church Registers tell us that Thomas Davis was the innkeeper in 1677, 1699 and 1703. Documents of the Hardwicke and Stidcote estates mention, as innkeepers, Robert Ponting in 1728 and 1735, John May in 1747. 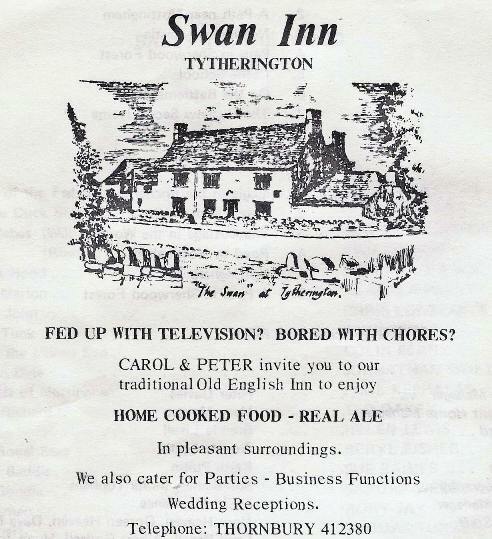 The Manor of Tytherington was sold by the Willoughby de Broke family to Peter Hardwicke in 1728; the first mention of the name The Swan is found in the sale document: ... one messuage called The Swan alias Tytherington Inne ...' The recognizances required from ale house keepers from about 1640 have not been consulted; a complete list of the innkeepers might emerge from a detailed study of them. But the Land Tax Returns show Joseph Cox 'at the Inn' in 1780, his widow Mary in 1784, and William Thompson in 1800. 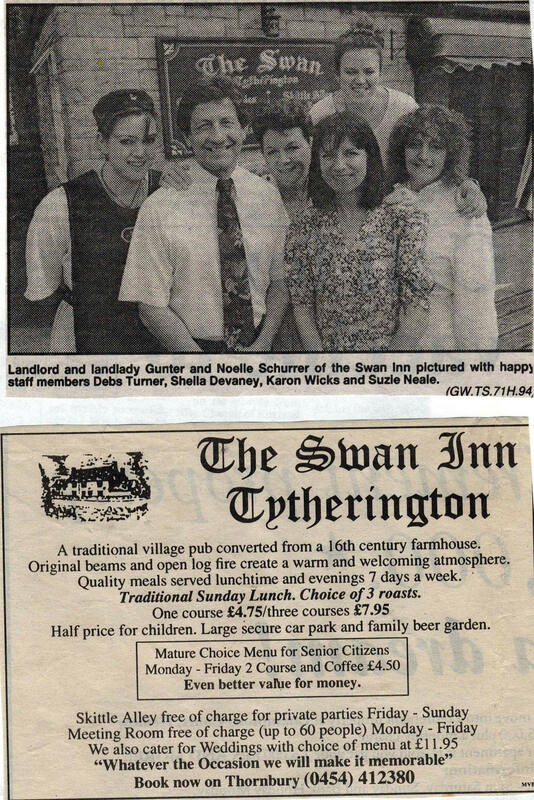 1840 was a significant date in the history of The Swan. 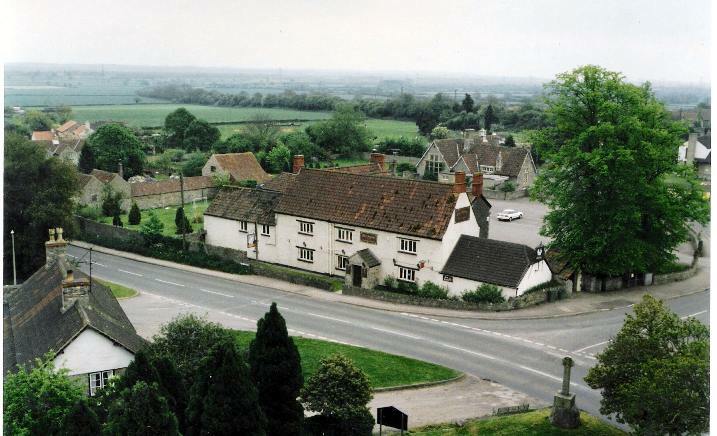 Up to this time, there is no evidence of where it was sited in the village, except that by 1839 it was in a small building at the rear of Edwards Farm, with a garden extending to Lower Road (where the school building is now). In 1840 Thomas Hardwicke, Lord of the Manor, finding the farm buildings opposite The Grange (the traditional manor farm) redundant, let the buildings to Issac Fry for use as 'The Swan Inn'. 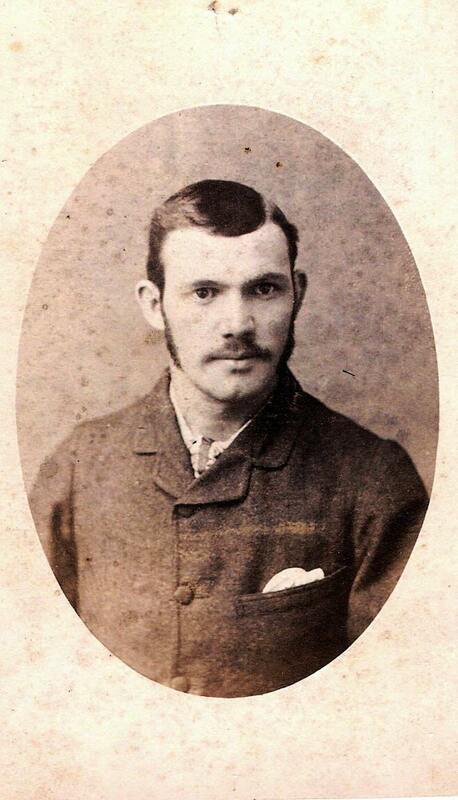 Thomas Hardwicke was in effect the last of the line in Tytherington and was coming to the end of his life. His wife and all his seven children were dead, he was living with a bachelor brother and spinster sister, he had quarrelled with the vicar and he was no doubt glad to have a settled use for his farmhouse. Issac Fry had previously been variously described as butcher, chandler, chapman, and victualler - that is, a general provider of food and household goods. He may already have been living in the farmhouse; certainly, all his ten children were born in Tytherington. Once established, and licensed to sell spirits as well as beer, the newly sited Swan may have taken trade from the Beer House, which was by 1851 occupied as a private house. Issac Fry continued as innkeeper for another twenty years. 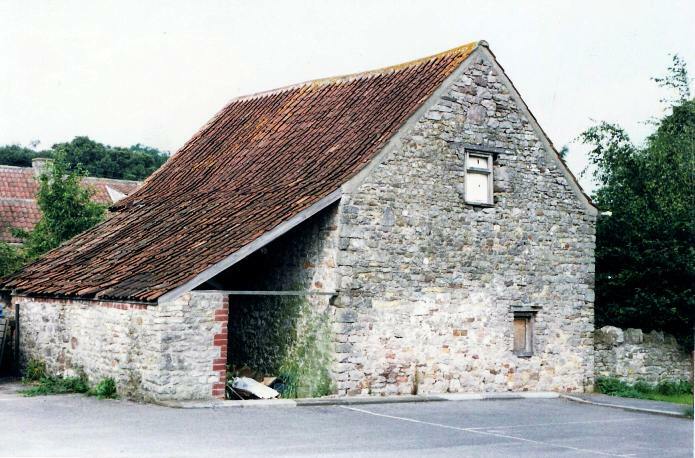 His eldest son James became a shoemaker, married a Bristol girl, had seven children, and lived in the cottage across the road from West Street Farm which was subsequently demolished for quarrying. His wife died in 1851; a year later he remarried and left the village, leaving behind a daughter as barmaid at The Swan. It was the third son, Charles, who continued the name Fry at the Swan. Working first as a cordwainer (shoemaker), he married Elizabeth Daniels in 1862 and took over the pub from his father Issac, who went across the Green to live for another eight years, to 1870, in No 1 Church Cottages. Charles and Elizabeth (daughter of Thomas Daniels, shoemaker, and Sarah, shopkeeper, who lived in a house across the road from the Church - in what is now Jubilee Field) had two children, Charles and Ursula. Charles senior died quite early (1868) leaving his widow to run The Swan, but she did not remain unmarried for long: in 1871 she married Charles Edward Heaven, by whom she had seven children. Heaven died in 1892, Elizabeth in 1894 in Chipping Sodbury. During the nineties, the innkeeper was William John Phillimore. 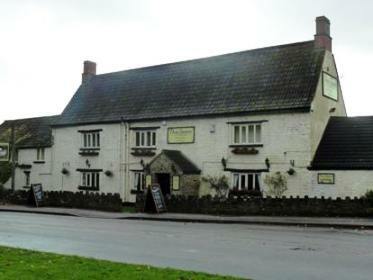 A native of Cromhall, he had married Elizabeth Tyler in 1880 and had been farming 57 acres at Woodleaze, but when Charles Heaven died, he took over The Swan. He was active as a parish official: Waywarden (responsible for the local highways) for eight years, assistant Overseer of the Poor from 1888, Clerk to the School Board, and, with the establishment of Parish Councils in 1894, the first Parish Clerk. However, his life was cut short in 1898, when he was 42, by the outbreak of typhoid in the village. Two Tyler girls died, also, and the Squire's two daughters were ill but recovered; the resulting agitation brought mains water to the village in the next year, paid for (oral tradition has it) by the Squire. 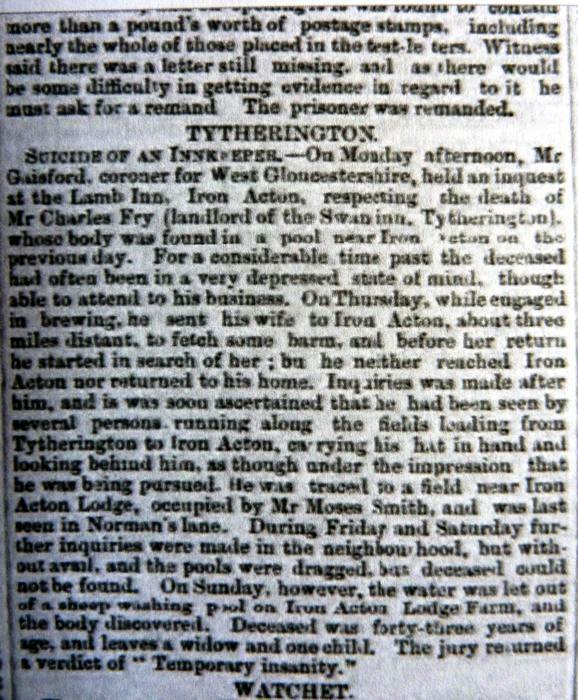 It was at this time that Charles Fry (Issac's grandson) returned and moved into The Swan; he had married Ellen Lester and had several children. After the first World War, the Squire, H L Hardwicke, perhaps in some financial difficulty, was selling some of his properties the village, and in 1922 he sold The Swan to Charles Fry. Shortly afterwards, Charles died, but Ellen continued with the pub until 1929, when she sold it to Bristol Brewery Georges & Co. Ltd. She died in 1940. In subsequent years, outbuildings and the public weighbridge we removed, a bus shelter erected, and certain parcels of land were sold to the Gloucestershire County Council for road widening. Thus ended the Fry connection with The Swan (lasting almost a hundred years), but not with the village. Charles and Ellen's eldest daughter Fanny Elizabeth (1892-1962) married Sydney Charles Clements, of Yew Tree Farm (renamed Hill View), and their youngest daughter Beryl (who married Ken Brown) still lives in the village. Charles Fry is pictured left with his wife Ellen, four daughters, two sons, and a bearded relative. Report from Taunton Courier 26 Aug 1868 Fanny Elizabeth Fry one of the three sisters who lived in the Swan c 1910. She married Sydney Clements Charles Fry purchased the Swan from Squire Hardwicke in 1922 Barn at Edwards Farm viewed from the Swan car park. 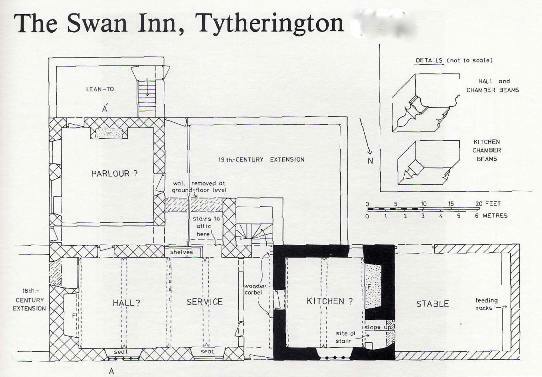 Possibly the first Swan Inn ? Mr & Mrs Stainer landlords in 1970 with Claire & Peter Brazil Swan 1974 before porch added Swan viewed from Church Tower Villagers waiting outside the Swan for something to happen!! What and when?